Game Show Mania, LLC designs, manufactures, and sells unique game show systems and peripheral equipment specifically built for live performance, audience participation and interaction. Our "TV type" Game Show Systems can be used by nightclubs, bars, resorts, cruise lines, schools, colleges, disc jockeys, entertainers, corporate event planners, and shopping malls, etc...., for store promotions, reunions, bar/bat mitzvahs, educational challenges, parties and many other event applications. Trivia, quiz, and our "Game Show Mania" are just a few of the many games available for use with our Game Show Systems. Our products are portable, easy to set up, ruggedly constructed and fun to use. We use only high quality components, and our equipment is assembled in the USA. 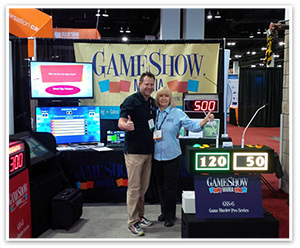 Game Show Mania, LLC systems are perfect for any application where entertainment and fun is important. Make your next event one to remember with Game Show Mania!